The final weeks of school have ended, but there is plenty of news you’ll find right here in the last official blog post of the 2015-16 school year. Thank you for your patience as we worked to compile this final blog of the year. We enjoy sharing news from our District with you regularly throughout the school year. Blog posts will resume in late July to prepare for the 2016-17 school year! The first day for students in the 2016-17 school year is Aug. 17th. To download a copy of the 2016-2017 school year calendar, please click HERE. Enjoy the remaining weeks of summer break! Olmsted Falls City Schools Board of Education has officially placed a school improvement bond issue on the November 8, 2016 ballot that will not increase taxes to residents. The issue will pay for upgrades to mechanical systems and school renovations so that money will not have to be diverted from the classroom teaching and instruction budget to make vital repairs. Previously the district had placed two bond related issues before voters. However both were narrowly defeated. The district did not seek a ballot request in March 2016 and instead looked at various financing options that would not increase taxes to residents. Instead the district is spreading the facility repair and improvement costs out over more time, so the amount of taxes homeowners have to pay each year will not increase. In addition, the bonds will be paid off over 35 years so that as new families move into the community, over time, they will contribute to paying them off. This issue also eliminates the need to hold classes in trailers any longer. This is important from a financial standpoint, as most of them have been in use so long that they will need to be replaced very soon with new ones that are now more expensive to purchase. Upgrade electrical systems and wiring to better support classroom learning systems and technology that is essential to a modern education. The district has posted a Frequently Asked Questions section to the home page of their website so that residents who have questions can get answers. Residents are also encouraged to contact the district’s administrative offices at 440-427-6000. 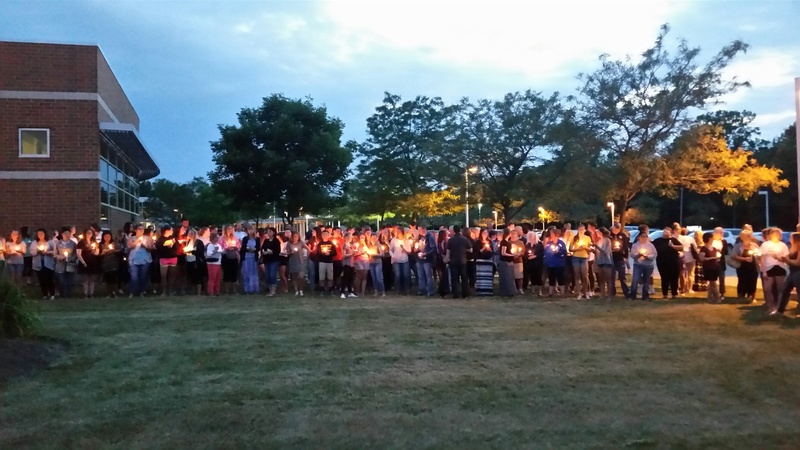 Student-organized candle lighting event honoring Ms. Christine O’Brien. 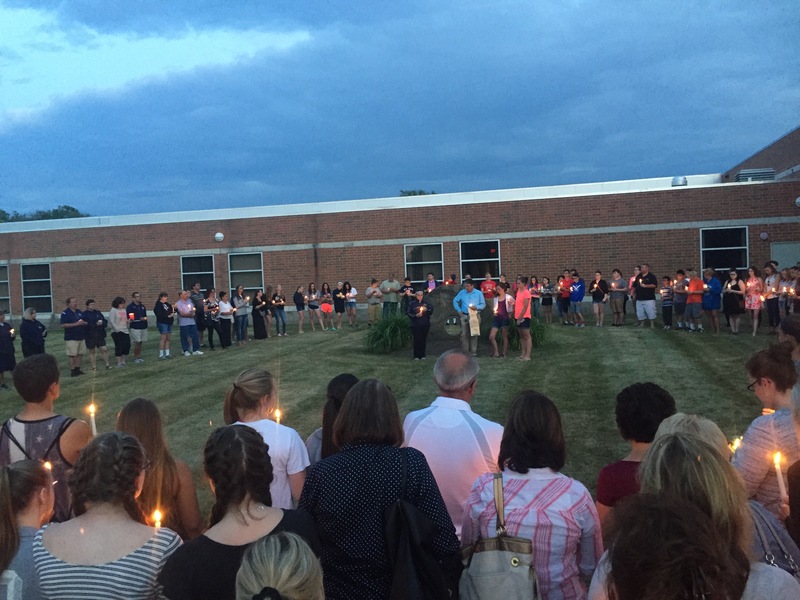 Students at Olmsted Falls Middle School organized a candle light vigil held Tuesday evening in front of the Middle School to honor and remember math teacher Christine O’Brien, who passed away suddenly on June 12th. Approx. 350 students, parents and staff members attended the moving event which took place on the lawn near the grindstone rock. Ms. O’Brien was an amazing teacher who taught for more than 20 years in Olmsted Falls, and who served this community and our students well. The Greater Cleveland Council of Teachers of Mathematics had just recently named Ms. O’Brien one of their Outstanding Mathematics Educators of the Year. 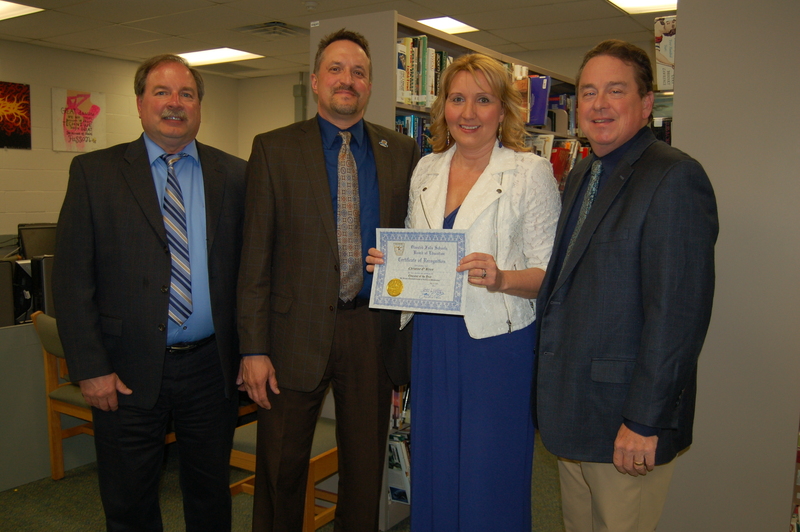 L to R: Board of Education President Joe Bertrand, OFCS Superintendent Dr. Jim Lloyd, Ms. Christine O’Brien and OFMS Principal Mark Kurz at the regular May 2016 Board Meeting where Ms. O’Brien was recognized for being named an Outstanding Mathematics Educator of the Year by the Greater Cleveland Council of Teachers of Mathematics. A Celebration of Life Service will be held this Saturday, June 18, 2016 from 1-5 P.M. at the A. Ripepi and Sons Funeral Home located at 18149 Bagley Road in Middleburg Heights. Olmsted Falls City Schools continues to keep the O’Brien family in our thoughts. Congratulations to the 295 members of the Class of 2016! Parents, family and friends gathered at Cleveland State’s Wolstein Center on the evening of May 26th to celebrate Commencement. OFHS graduating seniors Matthew Fox (pictured at left) and Zachary Buchta (pictured at right) were featured speakers, along with School Board President Joseph Bertrand and OFCS Superintendent Dr. Jim Lloyd. 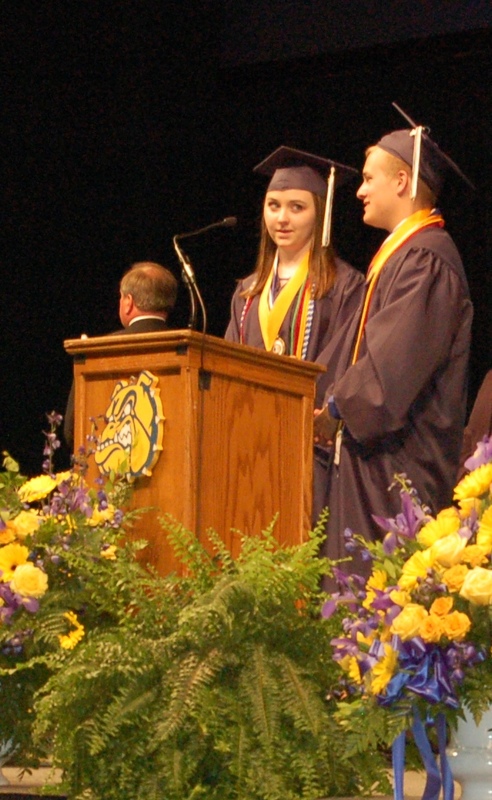 The singing of the OFHS Alma Mater was led by Matthew Fox and Courtney Nelson. New to the ceremony this year was a pre-recorded video introduction segment featuring members of the graduating class sharing information with guests that in past years has simply been read aloud at the start of the ceremony. Courtney Nelson and Matthew Fox lead the Alma Mater. 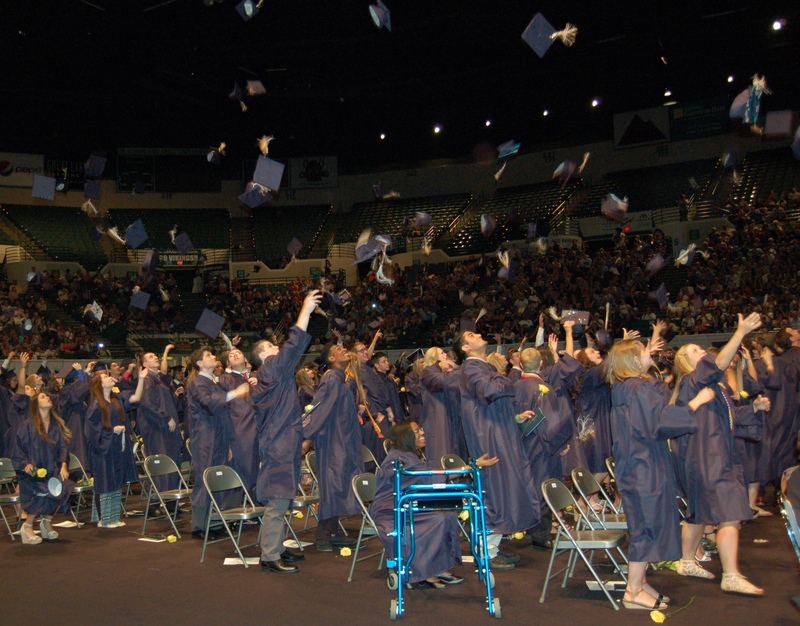 The new OFHS grads toss their caps into the air. The new overview video provided an opportunity to showcase the many honors and affiliations represented by the cords and medallions worn by students during the ceremony. To view the video shown at the Class of 2016 Commencement, please click HERE. For more photos of this event, please click HERE. To read the Commencement program, click HERE. Many OFHS graduates also participated in the annual Baccalaureate service held in the OFHS auditorium the night before graduation on May 25th. To read an article published online in Joanne DuMound’s weekly column about Baccalaureate, please click HERE. 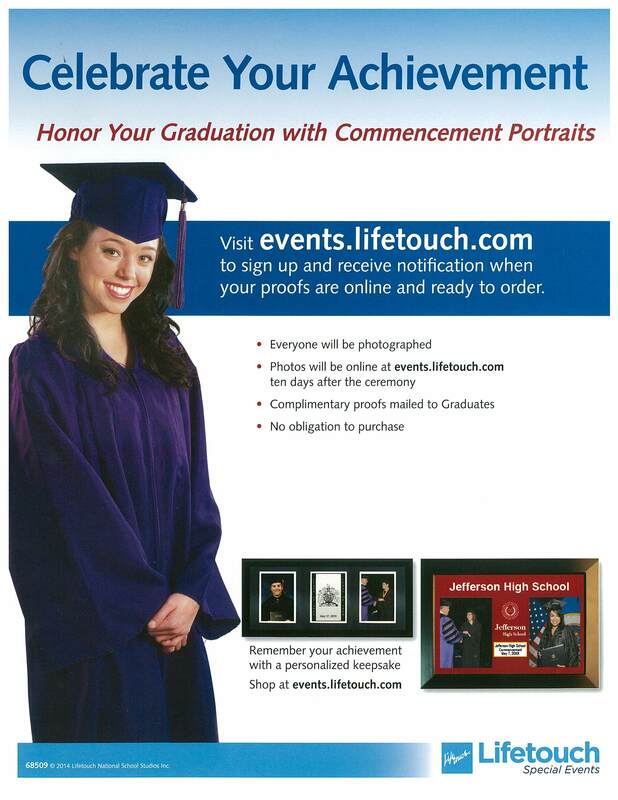 Lifetouch photographed all graduating Bulldogs at this year’s Commencement Ceremony held at CSU Wolstein Center. Photos are now available online at www.events.lifetouch.com. The new Social Studies materials for GRADES 4-5 and GRADES 9-12 remain available for review at the Olmsted Falls Library through this Friday, June 17th. Parents or any community members who wish to provide feedback are invited to do so using the online Resource Review Survey. Hard copies of the survey are also available with the materials at the library. An email notification regarding this latest opportunity to review curriculum materials was sent directly to all Bulldog parents Friday, June 3rd. OFCS Social Studies teachers at Olmsted Falls Intermediate School and Olmsted Falls High School previewed a multitude of Social Studies resources. Multiple vendors provided a face-to-face overview of their materials. Teachers spent multiple days previewing the materials and using a quality review rubric to determine the strongest resource. 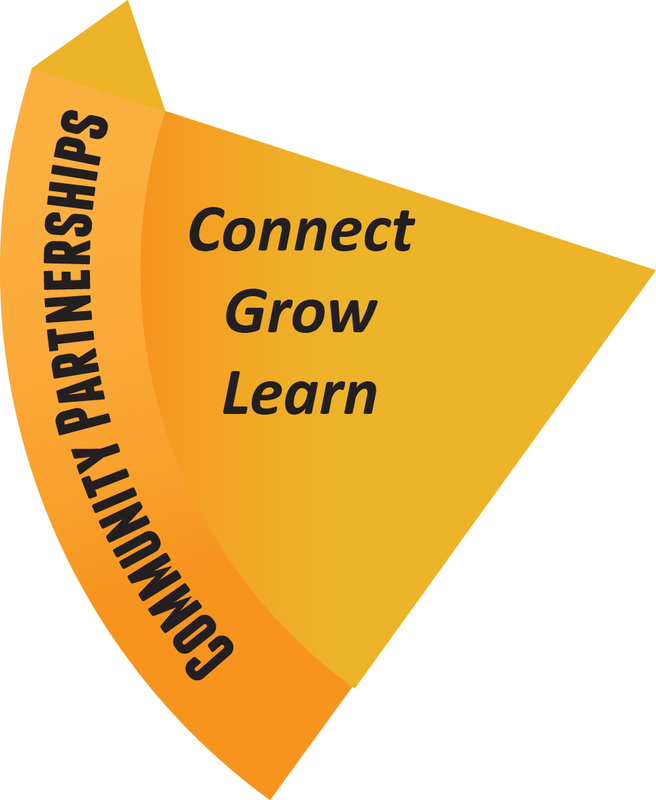 These materials will remain available for community review at the Olmsted Falls Public Library through Friday, June 17th. 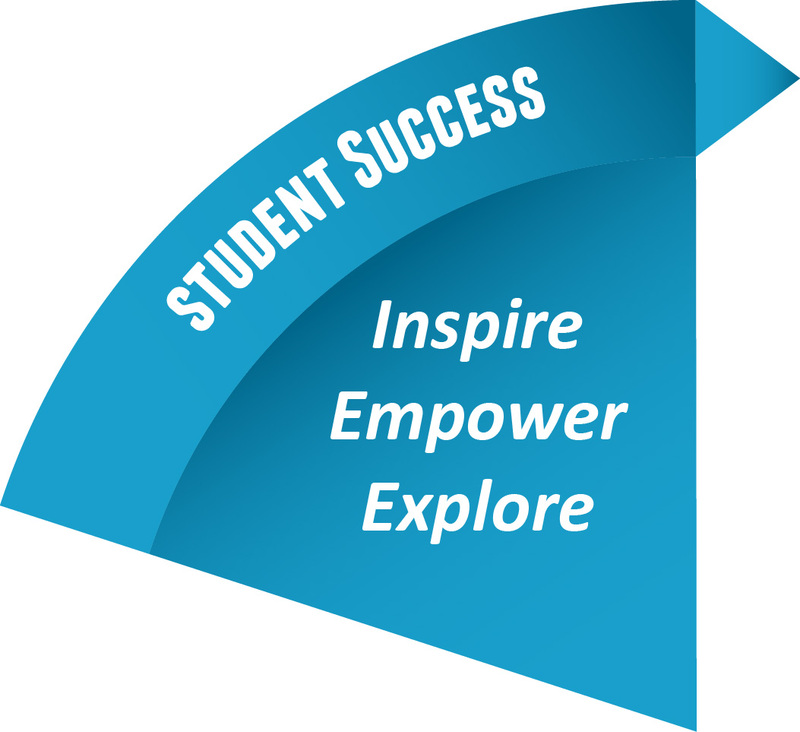 For additional information, including instructions on how to access the Social Studies Curriculum Resource Review Survey, please click HERE. If you have any questions, please contact the Board of Education office at (440) 427-6000. Mrs. Megery was joined by her family in Columbus as she received the Franklin B. Walter Outstanding Educator Award this week. The Franklin B. Walter Outstanding Educator Award is presented to one educator from each of Ohio’s sixteen State Support Team regions, who have made extraordinary contributions to the education of students with disabilities. 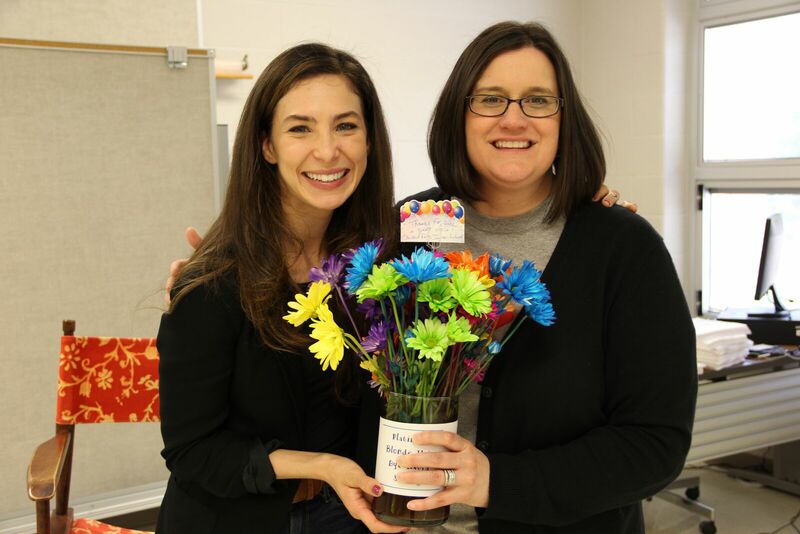 Congratulations to Falls-Lenox Intervention Specialist Mrs. Karen Megery, who was nominated by parent and Helping Hands Board member Meg DiFilippo for this year’s award. 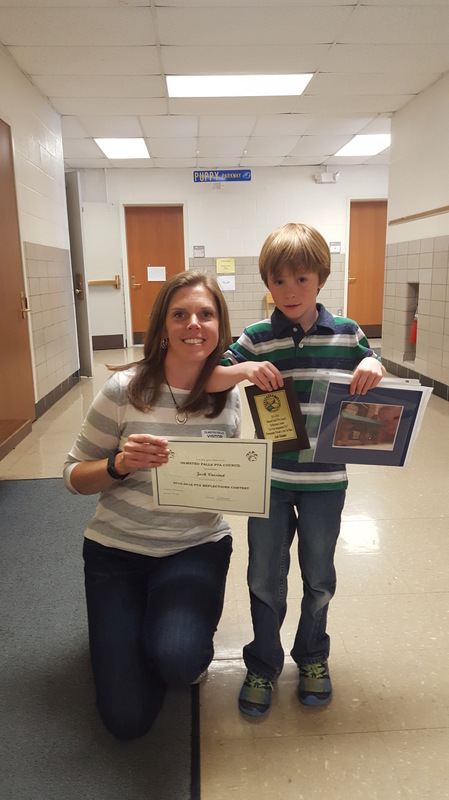 Mrs. Megery was selected from a pool of nominees in region 3 to receive this award based upon the narrative submitted that outlined her specific accomplishments and contributions at Falls-Lenox Primary School. She is one of just 16 educators in Ohio to receive this prestigious award! 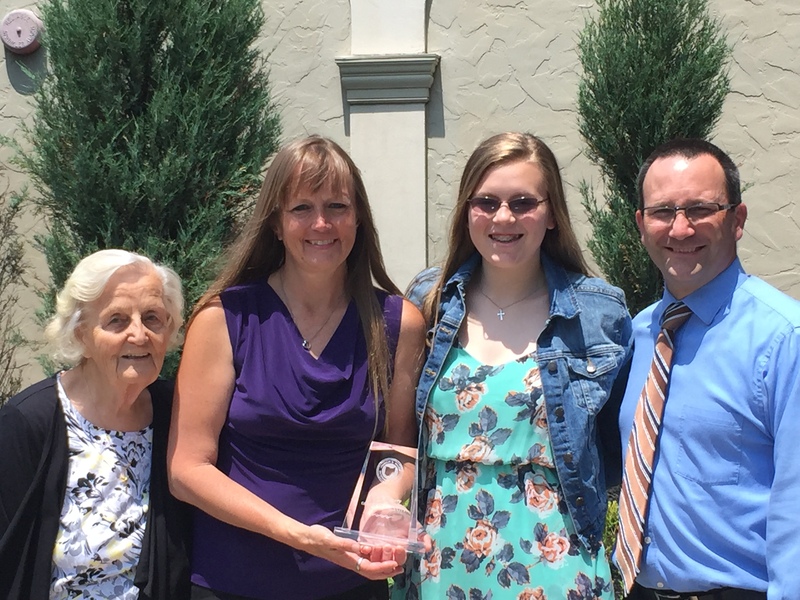 The Franklin B. Walter Outstanding Educator Award was presented to Mrs. Megery during a special Awards luncheon held in Columbus on June 15th, sponsored by the Ohio Coalition for the Education for Children with Disabilities along with the Ohio Department of Education. She was joined by her family and Falls-Lenox Principal Colleen Longville for the special event. Named in honor of the late Dr. Franklin B. Walter, Superintendent of Public Instruction from 1977 until 1991, a post held longer than any other state superintendent in Ohio’s history. With over 50 years of service as a teacher and administrator, Dr. Walter’s leadership is evident in many of Ohio’s quality educational initiatives and programs. Among these is the development of the nation’s first statewide plan for children with disabilities. Congratulations to Mrs. Megery! Our students and families are so fortunate to have you in Bulldog country! The OFHS Class of 2016 made two very special stops on their way back from commencement practice on May 25th. 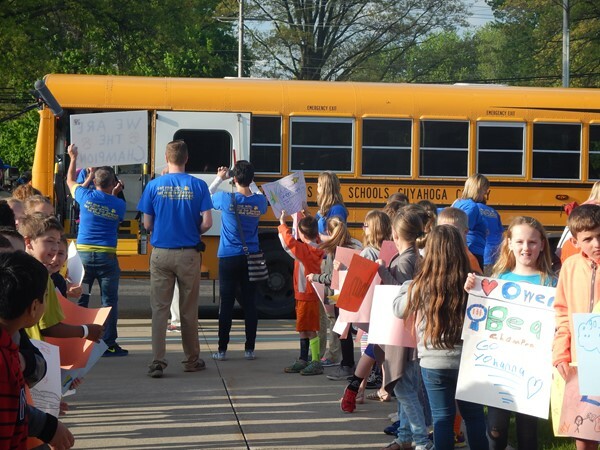 The soon-to-be grads visited both the Olmsted Falls Early Childhood Center and Falls-Lenox Primary School where they were met with cheers of congratulations from the district’s youngest Bulldogs! The Class of 2016 paraded through the hallways of both buildings and the packed cafeteria at Falls-Lenox to share their excitement with our future Bulldog grads and Bulldog staff members. Olmsted Falls Endowment & Alumni Association Scholarship Winners from the Class of 2016. Thanks to the generous support of more than 80 local individuals, families, businesses and organizations who contributed to the Olmsted Falls Local Scholarship Program this year, $113,455 in local scholarship funds were awarded to students in the Class of 2016. Eighty-two local sponsors awarded a total of 225 scholarships to graduating seniors this year. To view the complete list of Local Scholarship Awards for the Class of 2016, please click HERE. Students in the Class of 2016 also earned an impressive collection of College/University and other scholarships this year. To review a list of students who were awarded College/University and other scholarships this year, please click HERE. 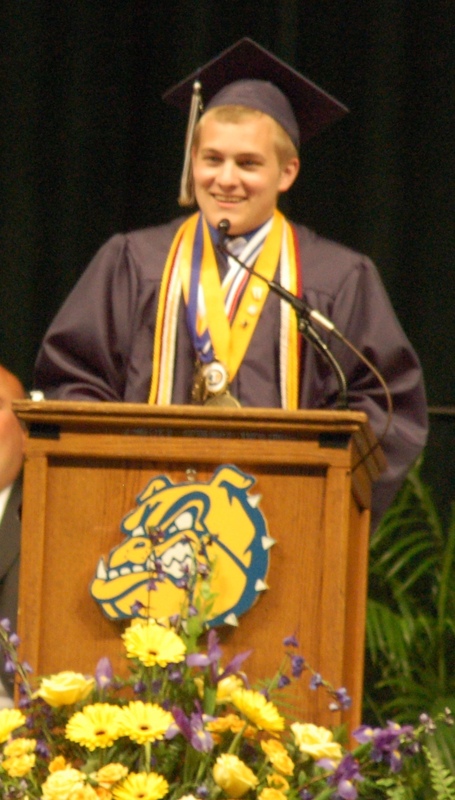 In addition to all the scholarships listed in the above College/University Scholarship link, Class of 2016 graduate Joshua Aubel was awarded a U.S. Navy ROTC Scholarship and will be attending Penn State University in the fall to study Aerospace/Astrospace Engineering. Congratulations to all of our scholarship award recipients from the Class of 2016! Best of luck to you all! Students of the OFHS Class of 2016 selected Physical Education and Health Teacher Mr. Kevin Ciolek to receive the annual Teacher of the Year Award at the Senior Honors Day Assembly held May 25th. 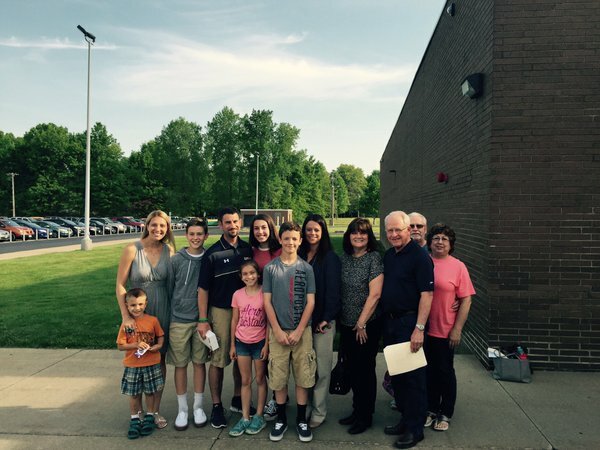 Mr. Ciolek was joined by his family to celebrate this special recognition. Congratulations to Mr. Ciolek on the well-deserved honor! There are still some Bulldog Summer Sports Camps available to keep students active over the break. 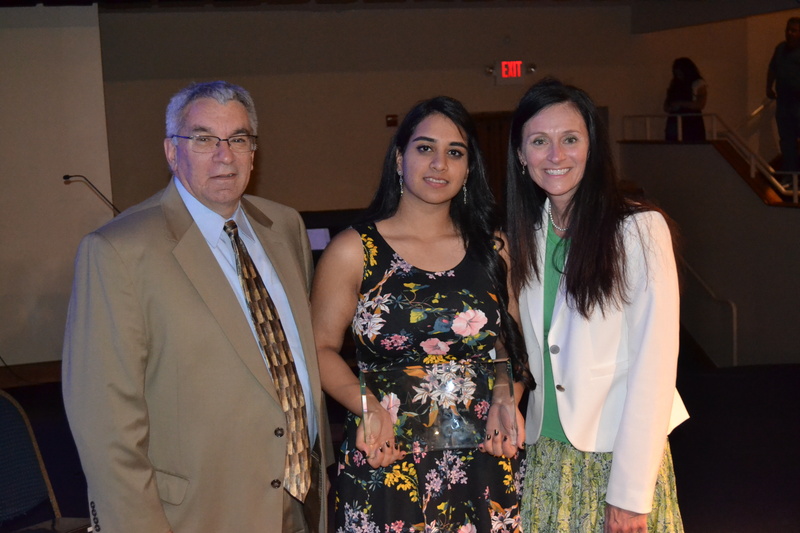 Polaris Outstanding Senior Award Winner for Class of 2016 Ruchi Patel with Polaris Board member Jim Weisbarth and OFHS Principal Holly Schafer at 40th Annual Polaris Senior Awards Ceremony. Congratulations to OFHS senior (now alumnus) Ruchi Patel on being named Outstanding Senior for Polaris Class of 2016. This top honor is determined by outstanding academic achievement, citizenship, service and extra-curricular activities. Ruchi completed the Medical Professions program with Polaris Career Center. Ruchi Patel has had an impressive two-year run at Polaris. This spring, her Health Knowledge Bowl Team took gold medal honors at the regional SkillsUSA competition. She has earned a 4.0 GPA in the Medical Professions program, was the recipient of the Academic Excellence and Art Awards at Olmsted Falls High School, was inducted into the National Technical Honor Society, was named the Outstanding Program Student as a senior and was a two-time Student of the Quarter honoree. Patel juggles a busy school, work and extra-curricular schedule. She served as a Polaris student ambassador, was a member of the Art Club, and participated in the MetroHealth Experience. Patel is the recipient of the University of Akron Presidential Scholarship. She plans to attend the University of Akron this fall to pursue a degree in Nutrition. Her long-term goal is to be a Nutritionist/Registered Dietician. Congratulations Ruchi! 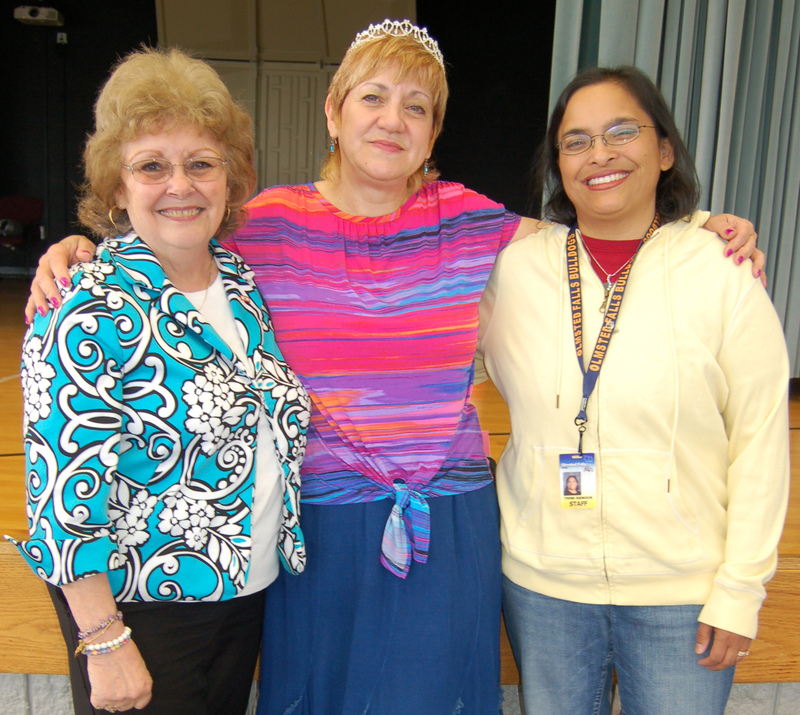 RETIREES DEDICATE MORE THAN 240 BULLDOG YEARS TO DISTRICT! Congratulations and best wishes to all of our Bulldog retirees this year! Olmsted Falls School District bids farewell to nine dedicated staff members retiring from the 2015-2016 school year. 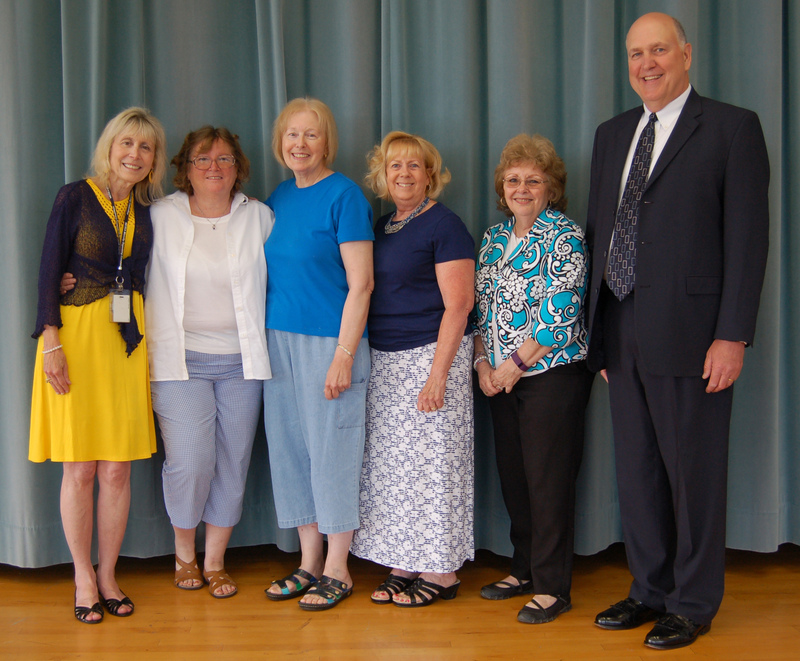 Their combined service to Olmsted Falls Schools total 245 Bulldog years! Congratulations to each of them and best wishes for a happy, healthy retirement! Enjoy the next chapter in your lives. 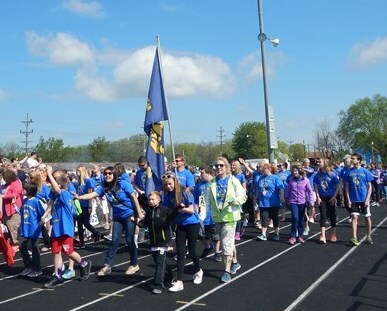 More than 45 students from across the Olmsted Falls School District participated in the annual Special Olympics Track & Field Day hosted at Ely Stadium in Elyria on May 13th. Students with moderate-intensive needs from 15 local school districts competed at the event. Students competed in events such as running, long jump and softball throw. Participating Bulldog students practice hard all year and their enthusiasm and sportsmanship are always second to none! Many athletes came home with first, second and third place ribbons! 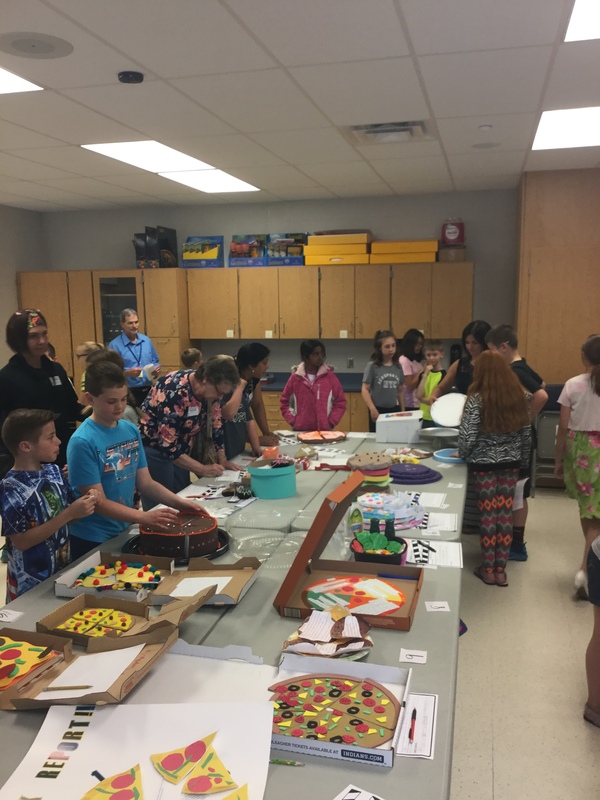 Olmsted Falls City Schools had student participants representing all five of our school buildings: ECC, Falls-Lenox, OFIS, OFMS and OFHS. 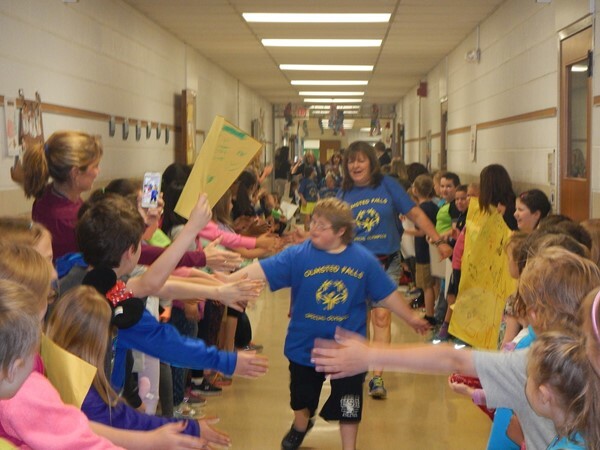 Each building gave its team of Special Olympians an encouraging send-off with students lining hallways to cheer their fellow Bulldogs on as they boarded buses to Ely Stadium. 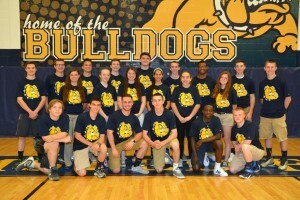 Our Bulldog Special Olympians included: Yohanna Amoah, Jacob Belohavek, Preston Brown, Russell Brown, Kara Cortes, Victor Darwish, Anthony DiDonato, Emersen Flynn, Sarah Gaughan, Heather Grant, Cormac Hannon, Shahan Kapoor, Colbie Krakowiak, Jacob Komitau, Jeff Laird, Maeve Leonard, Brionna Lewis, Mack Little, Matthew Matzelle, Bekka McElroy, Ellen McManamon, Clay McNamara, Mya McNamara, LuLu Mustafa, Owen Novak, Phoenix Novak, Aaron Oehlstrom, Caeden Peeler, Taylor Petitti, Jacob Siwek, Nathan Smith, Jaden Smith, Sarah Stevens, Tristen Thompson and Javi Vargas. A huge thank you goes out to the many staff members and volunteers who attended and helped the students have a fun and safe day! 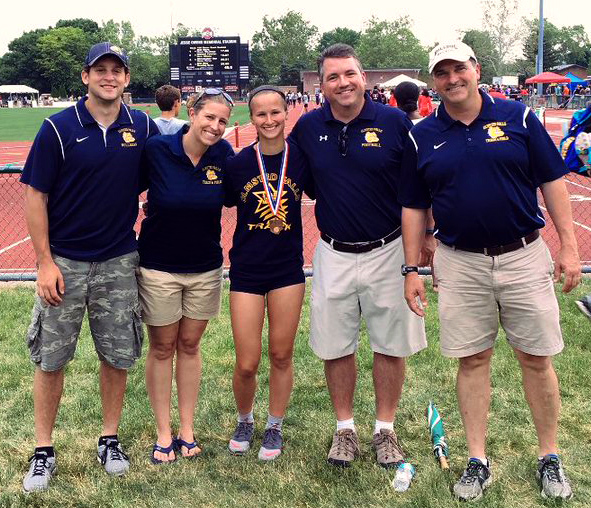 A very special thank you also goes out to the Olmsted Falls Athletic Boosters for the use of its tent and flag! To view a gallery of photos from this event, please click HERE. To view a video montage created by OFIS Intervention Specialist Cindy Zahorchak, please click HERE. CONGRATULATIONS to all of our outstanding local Olympians! Go Bulldogs! 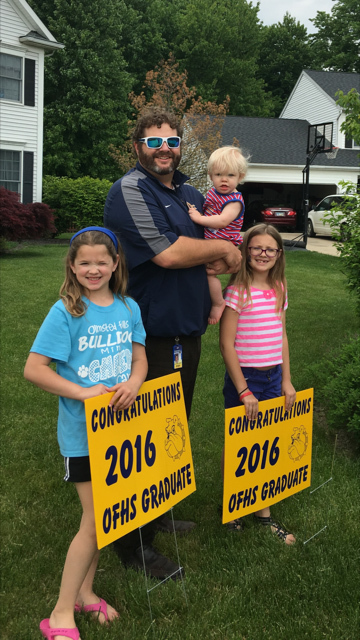 In what has become an annual tradition, all graduating Bulldogs received a congratulatory yard sign on the eve of the Class of 2016 Commencement Ceremony. Many thanks to OFMS teacher Dan Largent and the Olmsted Falls Education Association for coordinating the purchase, assembly and personal delivery of these signs by a volunteer group of administrators, teachers and staff. Congrats again to the OFHS Class of 2016! 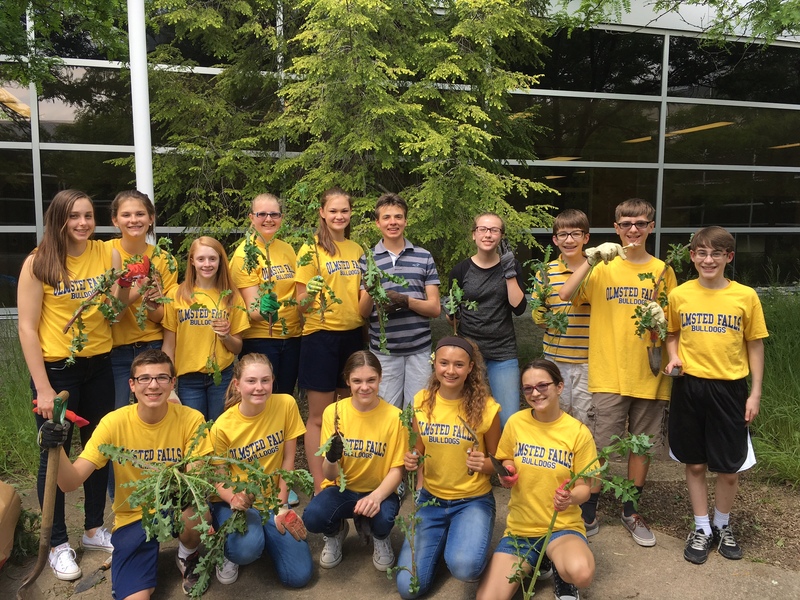 For their last full day as eighth graders at Olmsted Falls Middle School, the class of 2020 spent the day “Paying it Forward” by participating in service projects that helped the middle school, senior citizens in the community, local animal rescue shelters and veterans at the VA in Cleveland. 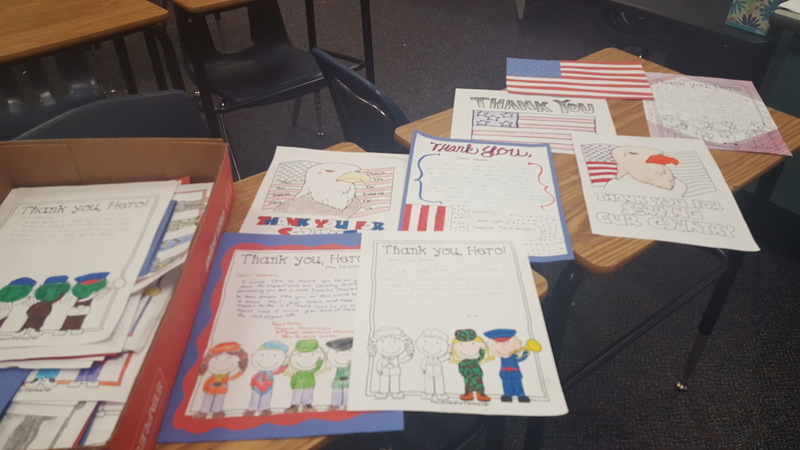 They also donated books and sent letters and bookmarks to children in need of books in the United States through the Reader to Reader Organization. 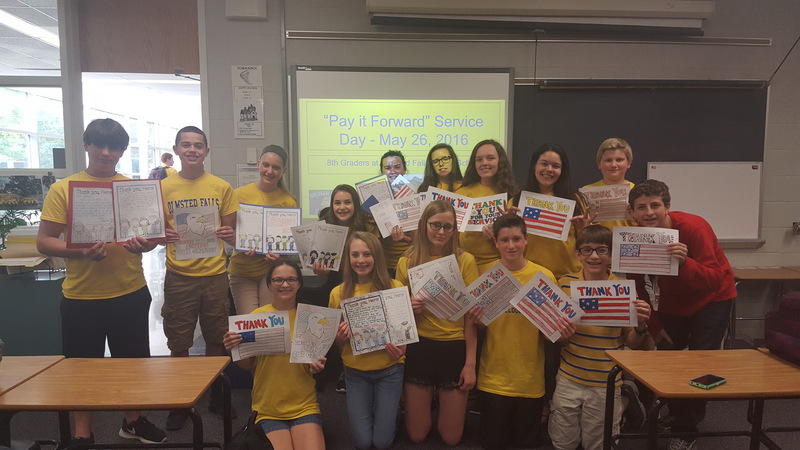 The students were able to experience the rewards of paying it forward and the amazing difference and impact that random acts of kindness can make on others. Students cleaned the beautiful courtyards at the OFMS and created posters with Rachel’s Challenge sayings that will hang throughout the hallways, wrote a variety of cards and decorations for senior citizens at the Eliza Jennings here in Olmsted Township, wrote letters of thanks and gratitude and made decorations for our heroic veterans at the VA in Cleveland. They also put together goodie bags for local animal shelters to give to those kind people adopting rescue animals and giving them a forever home and then made literary connections with students who are in need of books throughout the United States by donating over 300 books to students without them. 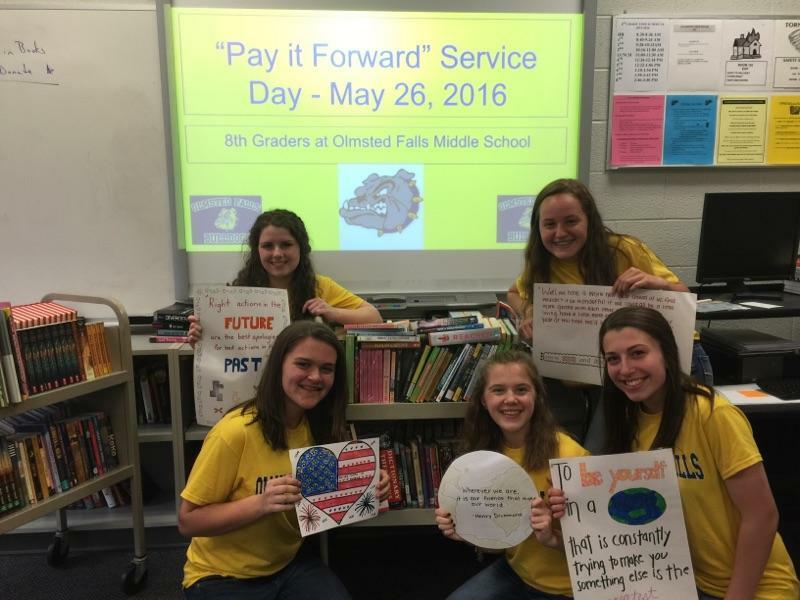 As the class of 2020 left OFMS on May 27, 2016, they definitely left their legacy through their random acts of kindness and generosity and made a huge difference in the lives of so many. We thank these students and wish them all of the best as they go to the high school, where we know that they will continue spreading this spirit and the Bulldog Effect of Paying it Forward. To view the complete 8th Grade Service Project photo gallery, please click HERE. Pictured here, from left, are ECC Secretary Loretta McClelland, ECC Principal Melinda Brunner and OFMS English/Reading Teacher Thimi Kemock, who are this year’s OF Kiwanis Club’s Employee of the Year winners. Staff members are nominated annually for Employee of the Year by their fellow colleagues. A special committee of Kiwanis members reviews the nominations and then selects the awardees. Congratulations to all three 2016 Employees of the Year! A special thank you to the Kiwanis Club for its continued support of the Olmsted educational community. 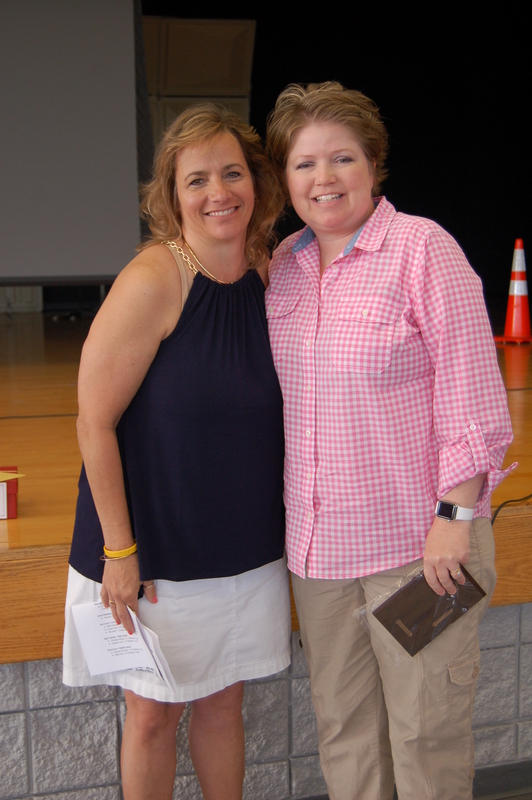 Falls-Lenox teacher and OFEA member Michelle LaGruth (left) presented Bulldog supporter Mrs. Kristie Patton (right) with this year’s “Friends of Education Award,” which the Olmsted Falls Education Association presents annually. Mrs. Patton was recognized for her dedication and commitment to the students and staff of Olmsted Falls Schools. A long-time teacher’s assistant at Falls-Lenox Primary School, Mrs. Patton is also a very involved parent who volunteers regularly in the classroom, is an active member of several PTAs and has worked in support of levy campaigns. Congratulations and much gratitude to Kristie Patton! This year’s multi-sport student-athletes were recognized for participating in three varsity sports. The Olmsted Falls High School Athletic Department and all Olmsted Falls Coaches would like to thank the multi – sport athletes & their families for their dedication and commitment to a variety of the interscholastic athletic programs this past school year. Row one: Charlie Linville, Andrew Ade, Jack Spellacy, Eric Hanna, Michael Howard, Alex Kho. Row two: Joselyn Rabbitt, Katie Knecht, Kellie Garrity, Sarah Makari, Victoria Kucler, Lauren Gumeny. Row three: Zach Wolanin, William Wendling, Andrew Turski, Adam Skutt, John McCabe, Ian Schneider, Trae Henderson, Theodore Grendzynski and Braden Galaska. Congratulations to all of our Bulldogs! Congratulations to the five members of the Bulldog Track & Field team who qualified to compete in the OHSAA Track & Field State Finals held June 4th at Jesse Owens Stadium in Columbus, OH. Mary Piper competed in the long jump and Bulldog Relay team members Morgan Summers, Maggie Bildstein, Francesca Klypchak and Summer Ellis proudly represented the Bulldogs in the girls 4×200 relay. 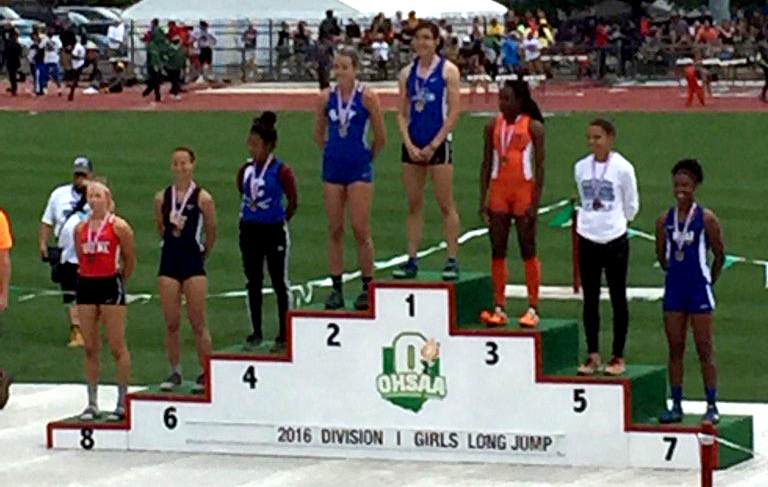 Congratulations to Mary Piper who took sixth place All-Ohio in the State D1 Long Jump competition! 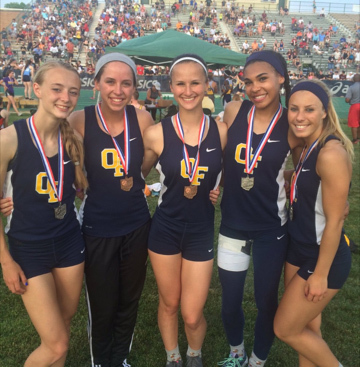 Kudos to the OFHS Track & Field athletes and coaches on a great season! Some OFIS students received an ultimate career day experience prior to summer break. 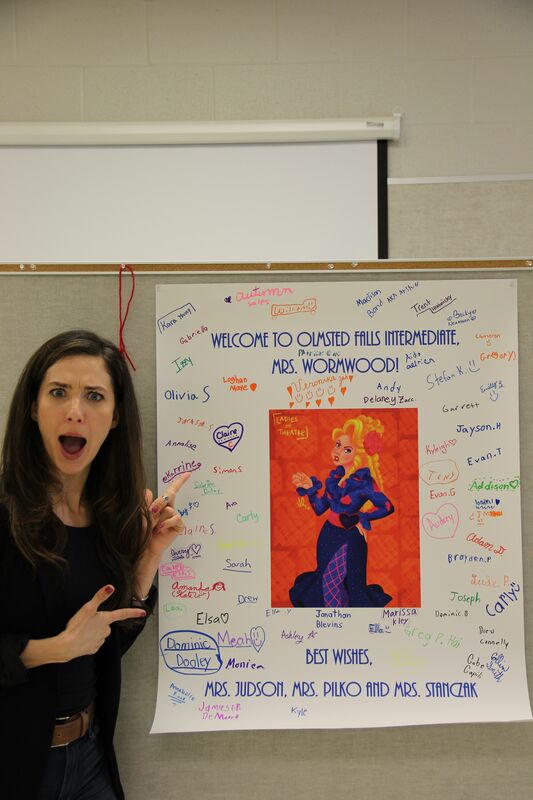 Cassie Silva, the actress who plays Mrs. Wormwood in the stage play “Matilda,” visited the team classes of Mrs. Judson, Mrs. Pilko and Mrs. Stanczak after the latter won a Playhouse Square contest. Cassie spent an hour with the students discussing her being a stage actress, her training, experience and the overall story of Matilda. Each student received a copy of the book and a chocolate cupcake! It was a wonderful experience for all. Congratulations to Josh Voisinet on placing 1st in the OFCS Primary Division for his Photography entry in the annual PTA Reflections contest! Josh was presented with his Reflections award in front his classmates at the ECC on May 20th. All ECC participants received a participation ribbon, a certificate, and a goodie bag that included a gift card to Falls Ice Cream from the PTA. 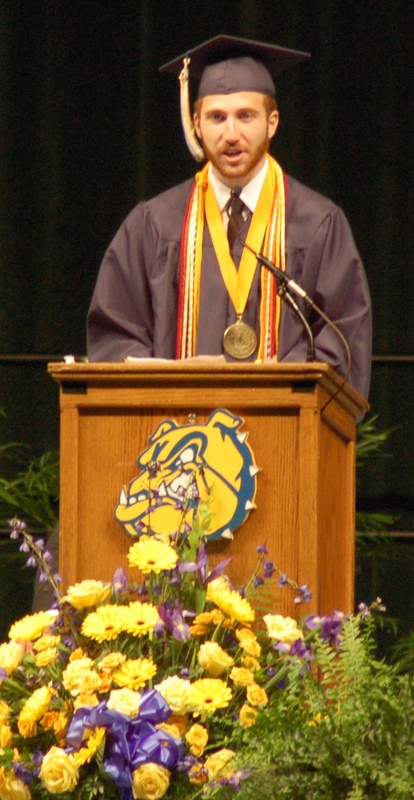 Bulldog 2011 grad Nick Macek addressed Mr. Mercer’s OFHS government and law classes last month. He has worked on several campaigns, including gubernatorial and presidential ones, and currently works for a nonprofit dedicated to clean energy. Nick also spoke to students about potential careers in politics and/or other civic areas. He told stories about meeting President Obama and Vice President Biden. The OFIS grade 4 language arts classes of Ms. Connelly, Mr. Sunkle and Ms. Tzolakis experienced a Book Buffet prior to summer vacation. Students chose any book they wanted and presented the project using food. 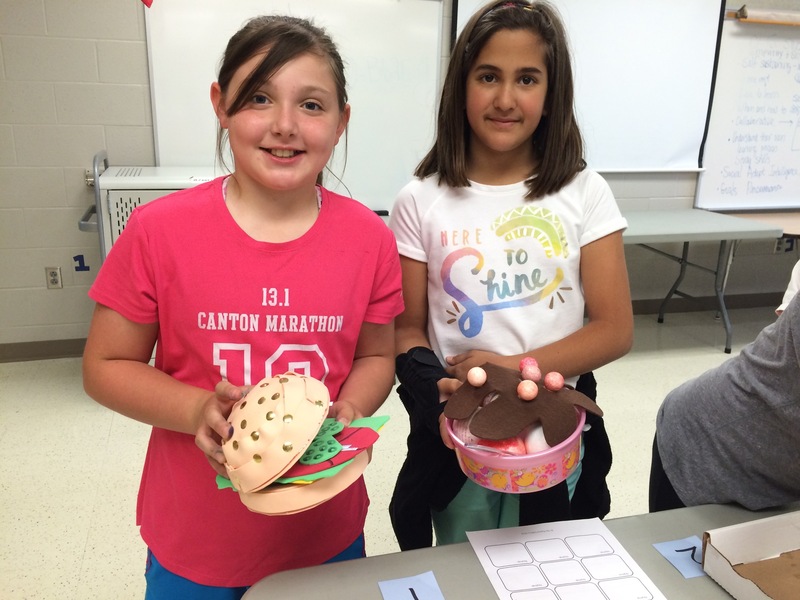 They had five sections – introduction, setting, characters/traits and evidence, summary and review — which needed to be incorporated into a model of a food item that fit appropriately with their chosen book. Students reviewed each other’s projects offering feedback to one another. Parents were also invited to visit a showcase of all the projects on display and provided some wonderful feedback as well. Everyone enjoyed this special year-end project and got lots of ideas for their summer reading lists! It was a very enriching Book Buffet. To view a gallery of additional photos from the Book Buffet, please click HERE. 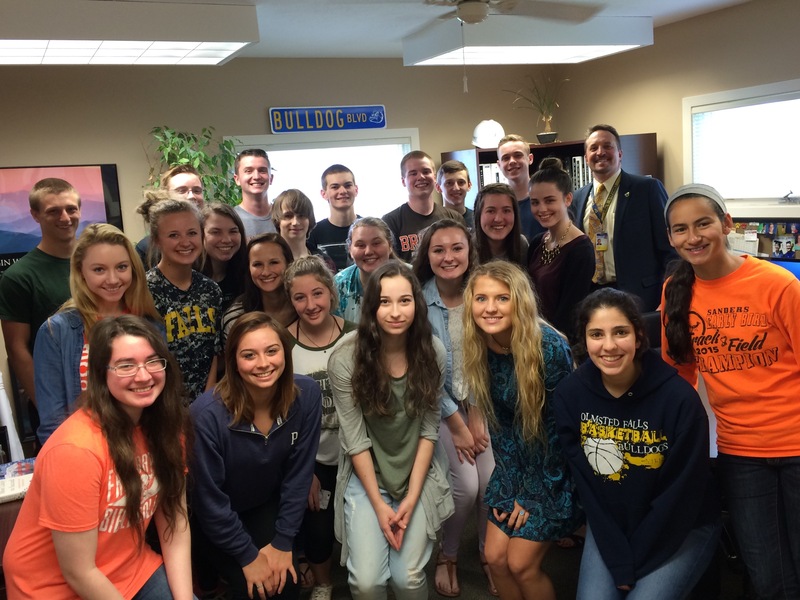 Mr. Gibeaut’s Sociology class took their semester photo with Dr. Jim Lloyd in the Superintendent’s office! Twenty-seven years ago, OFHS Social Studies Teacher Mr. Tom Gibeaut embarked on a unique and creative way to keep his classroom bulletin boards covered and decorated. Having admittedly limited artistic skills at the time, Mr. Gibeaut decided that if he began taking class pictures and blowing them up into 8X10 prints, he’d soon be able to get a couple of the boards covered. Today, at 10-12 semester classes per year, Mr. Gibeaut has close to 300 of these class pictures – about half of which now have to be stored in a file cabinet since he has more than exceeded the available bulletin board space in his classroom. There are currently about 150 of the class photos on display across the five bulletin boards in his room! 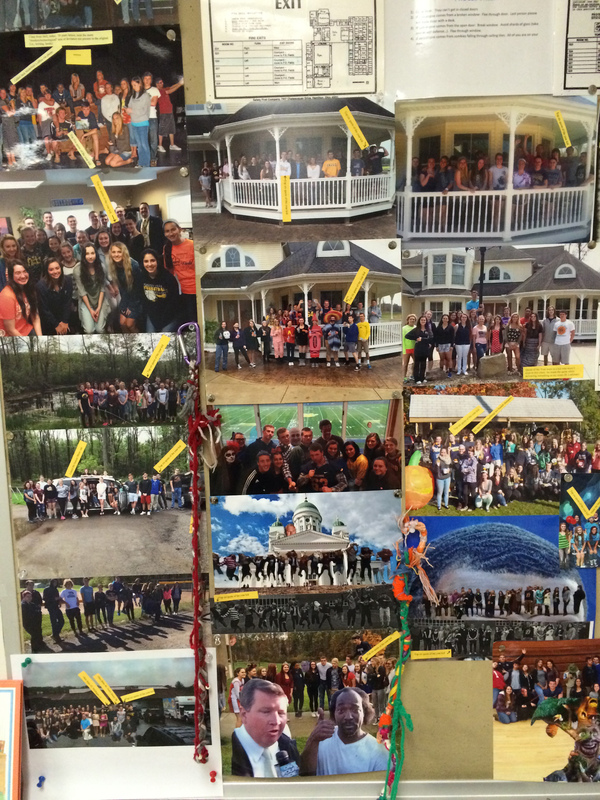 More than 150 class photos are currently on display in Mr. Gibeaut’s classroom. Each class makes its own decision regarding where to take their respective photos or what background to Photoshop their class into. Odd school locations over the years have included the Biology pond; the Press Box; houses of students who live nearby; Papa’s Produce; with various students’ cars; near the Turnpike; and even in certain school administrators’ offices! This year’s Sociology class scheduled a meeting in the Superintendent’s office – yes, the whole class – to capture their group photo for this semester. Over the years, classes have also used Photoshop to insert themselves into a variety of creative locations including Discount Drug Mart, Caesar’s Palace, the Death Star, and Bikini Bottom (from SpongeBob)! Kudos to Mr. Gibeaut and his students for their ongoing creativity in maintaining this tradition from semester to semester! 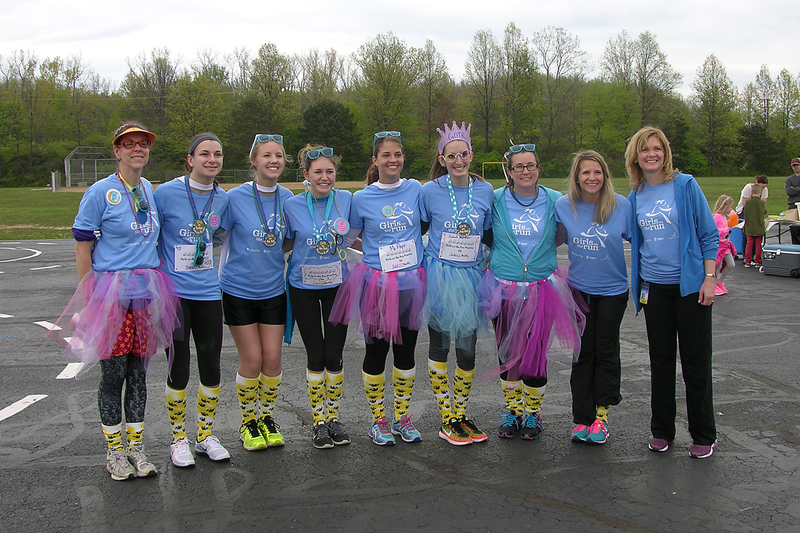 Girls on the Run was so much fun at Falls-Lenox this year! 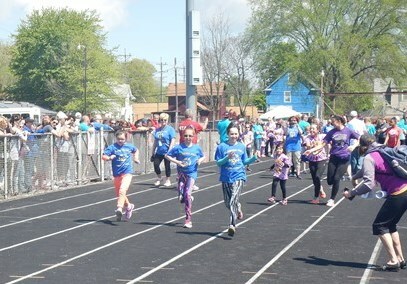 The third graders learned so many great life skills, worked as a team, became stronger young ladies and ran many miles! They participated in a practice 5K here in Olmsted Falls, which started and finished at Falls-Lenox. 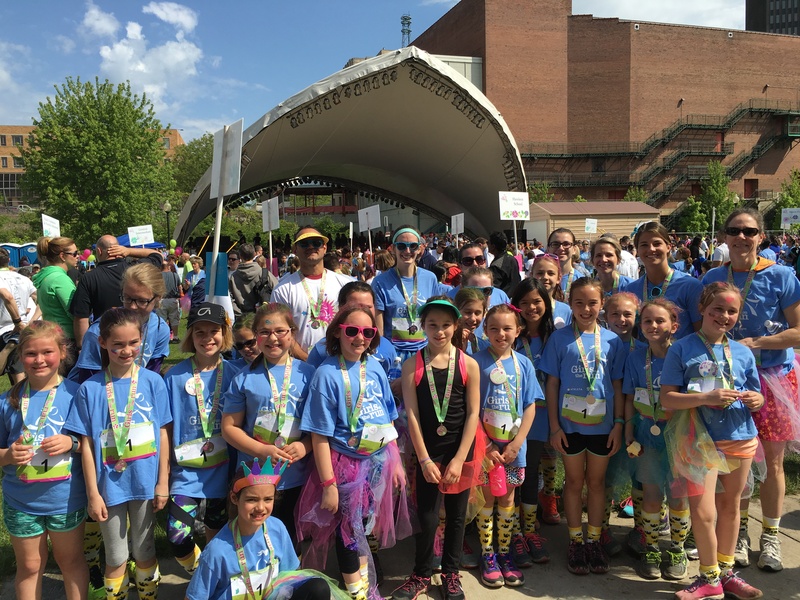 They also ran a season-culminating 5K in Akron on May 22, 2016. The girls did an awesome job, staying positive, finishing the races and supporting their teammates. We would like to thank all the parents, teachers, and friends for your support. We had so many running buddies, helpers and fans! We could not have done it without you! 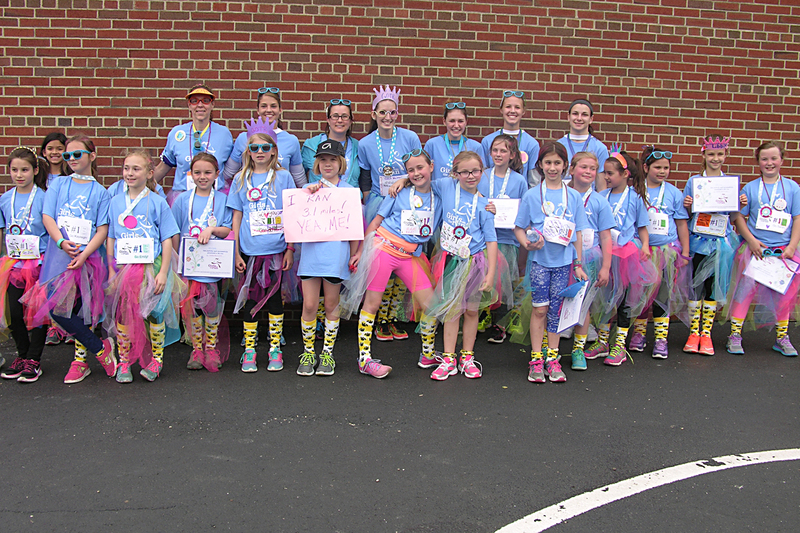 Thank you, GOTR Coaches Falls-Lenox Primary School. The June edition of the Olmsted Falls Music Association’s Musical Notes is filled with end-of-the-year honors, scholarships and pictures. It also includes information about the Feb. 16-21, 2017 Disney trip and a membership form. It may be viewed by clicking HERE. The group’s first monthly meeting of the 2016-17 school year is at 7 p.m. Sept. 7 in the OFHS choir room. Hope to see you there. The end-of-the-year Middle School Scholastic Buy One-Get One (BOGO) Book Fair was very successful. The fair helped students and staff take advantage of great deals on book for summer reading. 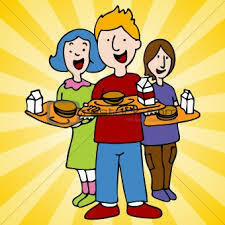 The North Olmsted School District received a grant again to sponsor breakfast, lunch and snacks for children during the summer. It is FREE to all children ages 1-18. The program runs now through Aug. 19. All meals must be consumed on site. The district is partnering with mCORE – Mobile Cardiac Overview and Risk Evaluation – to screen OF athletes for the cardiac conditions and abnormalities that may put them at risk for Sudden Cardiac Arrest or SCA. It is the #1 killer of student athletes each year, many of which could have been prevented with a simple examination like this. Space is limited at the 7:30 a.m. to 3:30 p.m. Thursday, July 28th screening. The screening takes about 10-12 minutes and includes an EKG and Echo screening. These tests usually cost about $2,000, but this July 28th screening charge is $75. To view a detailed flyer, click HERE. To sign up for the screening, go to mcoreathletes.com. Health Care Action Plans: If your child has a medical condition, which may require treatment at school such as asthma, diabetes, seizures, or severe allergies, etc., you will receive a Health Care Action Plan form from your child’s clinic staff. These will be sent home before the end of the school year. These action plans, which are completed by both the parent and the physician, provide staff with detailed care information should your child become ill at school. These should be completed over the summer and returned to the clinic during the first week of school in August 2016. If your child will need to take a medication at school, a medication order form is available on the district’s website. Needed vaccines: New 7th grade students: Ohio law requires a Dtap booster vaccine be given prior to entry into the 7th grade. Ohio Law also requires a Meningococcal vaccination for students entering the 12th grade. Please bring in your documentation that this is completed to your health clinic during the first week of school in August 2016. All forms listed above will now be available on the district website under School Health Clinic. Attention OFHS Parents: The first day of school for all grades at OFHS is Wednesday, August 17th. Incoming 9th graders for the 2016-2017 school year will have an orientation beginning at 7:26 am. Students in grades 10-12 will follow a LATE START schedule that same day. Bus routes will make pick-ups for both the regular and late start students. More information will be posted on the OFHS webpage the first week August. College Now will be offering free college financial aid advising services over the summer for students who have not yet applied for financial aid for the fall semester. 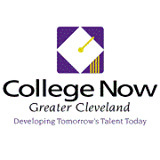 Please contact Taryn Rechenbach to set up your appointment at 216.635.6115 or via email at trechenbach@collegenowgc.org. Appointments will be held at the College Now Resource Center downtown on the 3rd floor of Tower City. Weekday and Saturday appointments are available. College Now’s mission is to increase college attainment through college access and success advising, financial aid counseling and scholarship services. It is offering summer boot camps to prepare for the tests. Each boot camp is a 16-hour course where students will learn about and practice for each section of these high-stakes college admissions tests. Every student will receive a real ACT prep book at the conclusion of the boot camp. Snacks will be served. The various camps will run through Aug. 22nd. To view a flyer with dates, click HERE: To register, click HERE. For various College Now programs and services, click HERE. 2017 Post Prom will be held at the school from Midnight – 3AM on Sunday May 21, 2017. There are still several committee and volunteer opportunities available for the 2017 Post Prom committee! We can only have a successful event for our children with your participation. To see a flyer of this summer’s activities, click HERE. Questions can be directly to bulldogspostprom2017@gmail.com. Eat at Chipotle during the June 28th Dine to Donate fundraiser that runs from 4-8 p.m. that day at its 26420 Great Northern Shopping Center. Bring in the flyer found HERE, show it on your smartphone or tell the cashier you are supporting the cause to ensure 50 percent of the proceeds go to Olmsted Falls Post Prom 2017. The second fundraiser runs from July 1 to Aug. 31 at the Berea Laserwash, 1425 W. Bagley Road. Enter the code 2170 and $2 will be donated to the group. Click HERE to see the flyer. Keep it in your car. Thanks for participating in these events. July 23th is set for the 21st annual John Sanders Memorial Golf Outing that the Olmsted Falls Alumni Association sponsors. It is open to all golfers and “want to be” golfers. The site is Creekwood Golf Course in Columbia Station. Please join us for a fun day that includes 18 holes of golf (shotgun format), riding cart, lunch, BBQ ribs and chicken dinner, golf favors and a chance to win prizes – all for only $85. Tee times begin at 8:30 a.m. Don’t miss this great event and an opportunity to support the Alumni Association and its scholarship programs. If you would like to receive a registration form or have questions, contact the Alumni Office via e-mail at ofhsalumni@yahoo.com or call us at 440-427-6030. Please click HERE for the registration form. 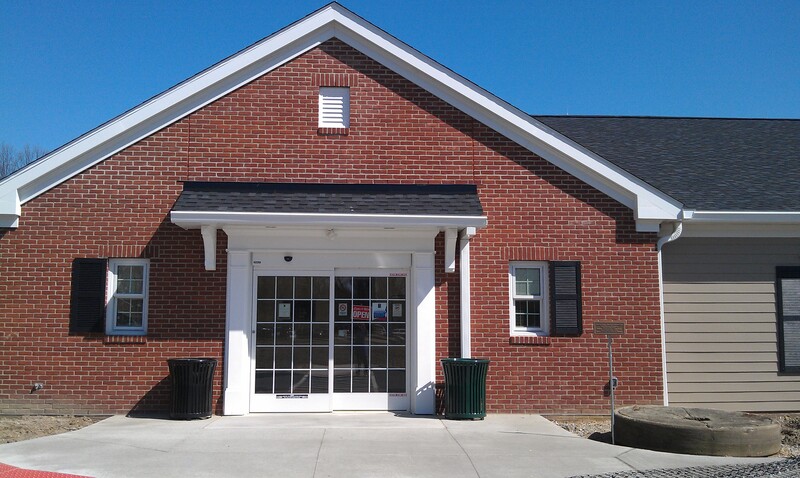 The Olmsted Falls Branch Library has many events throughout the summer that are free. 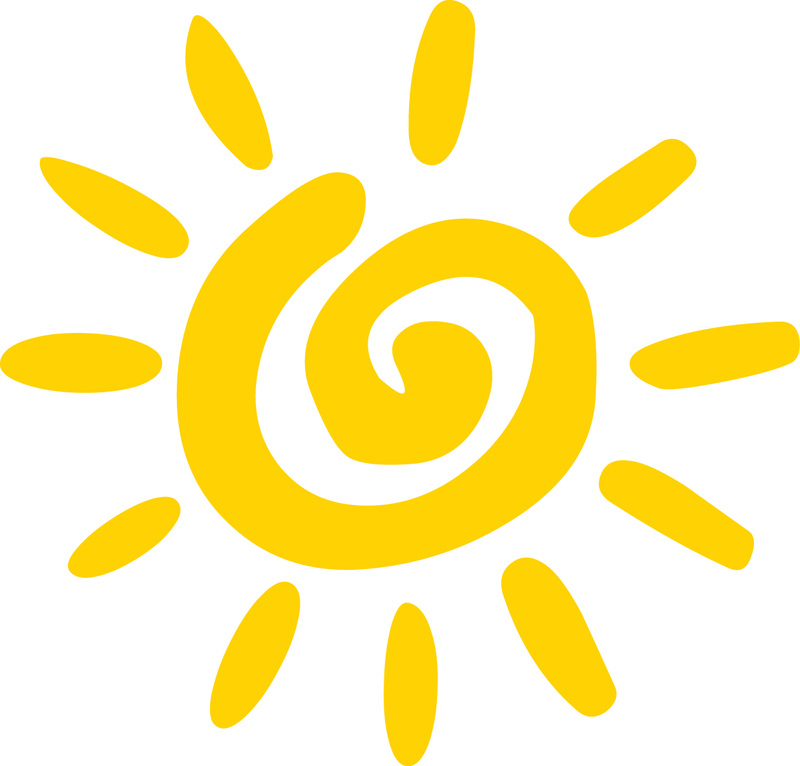 To view a flyer of all the library’s summer programs, click HERE. In observance of National Food Allergy Awareness Week, the Lake Erie Captains has announced a Peanut & Tree Nut Awareness Weekend during which the entire ballpark cleaned and no nuts/seeds will be served at concession stands. Both days include kids activities, parades and a baseball game against the Great Lakes Loons. Tickets should be bought at captainsbaseball.com/tickets. Be sure to enter the special code “NEOFAN” to enable the group to receive a small portion of each ticket sale. To see a flyer of the event, click HERE. NEOFAN stands for Northeast Ohio Food Allergy Network. This week a group of parents and NEOFAN supporters met with lawmakers about pending legislation – House Bill 200 – to stock undesignated epinephrine in public places, such as daycare centers, colleges, restaurants, camps and others. Share the joy of books with Little Buddies by reading aloud to each other and playing fun reading games. Please attend all 4 sessions. Big Buddies must attend the training session that will take place at 3:00 PM before the first Buddy session on July 7th. Grades 6-12: Click HERE for details. Share the joy of books with Big Buddies by reading aloud to each other and playing fun reading games! 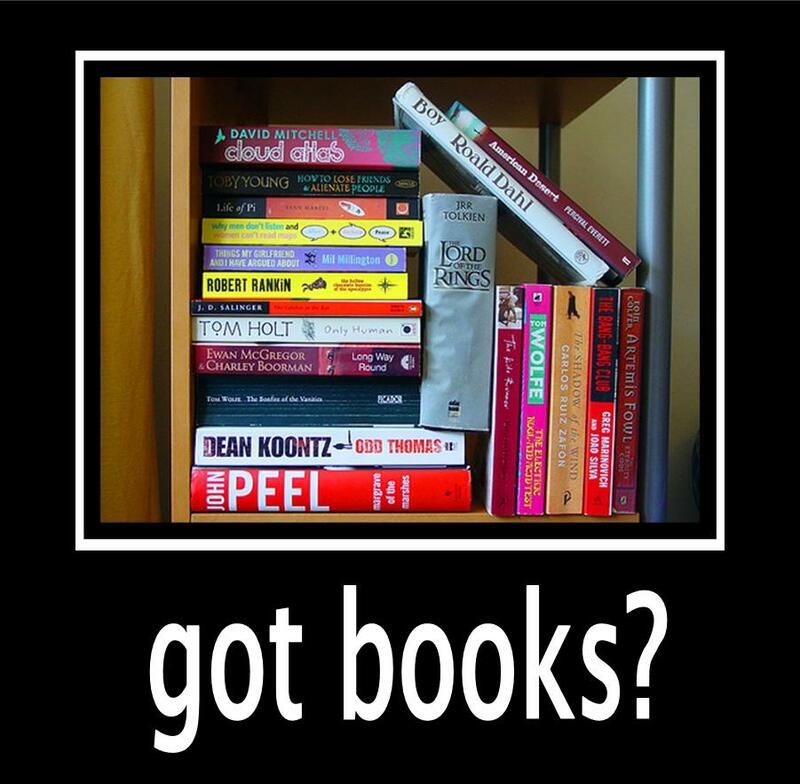 Children should have some reading ability. Please attend all 4 sessions. For children entering grades 1–3. Click HERE for details. The 5-day Broadway Bound Camp is from July 11-15 at Olmsted Community Center. Campers will work close closely with a Broadway actor and music director. For more information, click HERE.